The River Ouse is a lowland river in the South East of England. Rising in the High Weald AONB its numerous headwater streams travel through wooded gills and open floodplains, down through the chalk cliffs of the South Downs National Park to its river mouth at Newhaven. Comprising a network of over 1200km of river and stream, the River Ouse drains a land area of over 650km2, and incorporates the towns of Lindfield, Ardingly, Uckfield, Lewes and Newhaven (see map below). It also has its fair share of flooding issues - not just from river flooding, but also summer flash floods, groundwater flooding and also from surface water runoff (water travelling over ground from roads or the land). The River Ouse and its related chalk block also provides us with a range of important services, not least fresh water for drinking, and to support farming and other businesses. It further provides us with a wide range of other less obvious services, like biodiversity and water and nutrient cycling. It supports a wide range of fish and other species, and is home to a broad range of important habitats from woodland and heath to chalk grassland and vegetated beach shingle. The Ouse river catchment is also home to in excess of 150,000 people. In common with other rivers nationally, historic management such as land drainage and canalisation of the river has not only disconnected the river from its floodplain - reducing flood storage - but has also reduced the marginal bankside and wetland habitats so important for wildlife, and also for buffering the river against pollution. Our analysis of the historic Ouse river shows that many of the changes that have been made over the last 150 years have not only reduced the length of the river network, but also acted to speed up the drainage of the land after rainfall, which combined with other factors lead to an increase in the speed and magnitude of flooding. Recognition of the degradation of our river systems, and the implications this may have on the many vital services they provide, has led to a great deal of work to improve the health of our rivers. In terms of the Ouse much is being done. This work has involved a great number of different organisations and required good partnership working. Whilst lots of great work has already been completed, we still have plenty more to do. 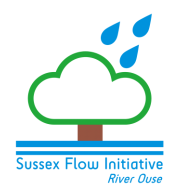 Sussex Flow Initiative are proud to be contributing to this work, which will help safeguard the healthy functioning of the river future generations. See our projects page to hear about some of the work we are doing. ​Below are links to different projects working to improve the River Ouse and its surrounding landscape.